It’s been stormy the whole Christmas period from a very bumpy landing at Dublin airport to being without electricity most of Christmas Eve. Tonight looks like being the worst of it. 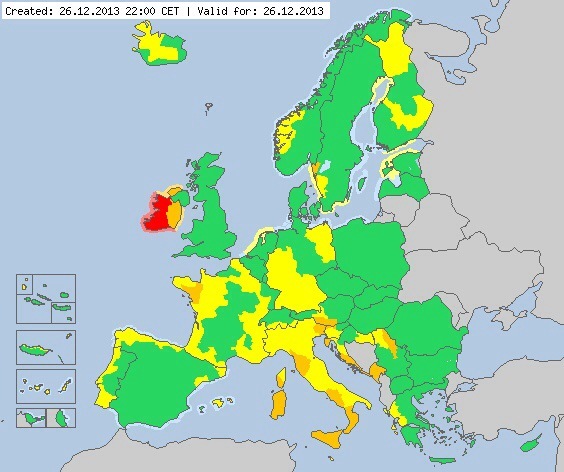 Winds are blowing like hell at the moment and it’s much worse in other parts of Ireland. At times like this, one needs a great weather app. All of the obvious and most reviewed ones are pretty useless when it comes to showing the forecast for wind. So after trying all of the top ones, I downloaded yr.no. Quite brilliant for showing predicted wind speeds and directions. The only quibble is that the meteorological forecast is in Norwegian. Encouraging news from Canada on treating this debilitating disease. Not sure how fast this treatment will become available as the profile motive doesn’t seem to be very strong in this approach. Eliminating MS completely and watching patients improve surprised both Freedman and Dr. Harold Atkins, a bone-marrow transplant expert, who started the study. The two originally set out to monitor the development of the disease and find a way to treat it. Their theory was this: Wipe out the entire immune system, reboot it with a transplant of the patientâ€™s own bone marrow and wait for MS to regenerate. Heartwarming story behind one photoshoot done by Von Wong. In September, my agent Suzy Johnston received an unexpected email from a lovely lady by the name of Nicole. She had a request: To have a creative photoshoot done of her before the 21st of September. Read the full account and see all of the wonderful photos on Von Wong’s site here. Concise article by Francis Vachon that explains the most common excuses for the theft of images on the internet. Photo of a quiet Sunday street at night in Helsinki near Senate Square.